The following are awards received by the staff writers for the Paw Print since 2017. The Paw Print is currently ranked #8 in the nation as a SNO Distinguished Site, with 24 articles published on Best of SNO. Paw Print reporters participated in the KQED Youth Takeover in April 2019, where four students had their audio packages selected to be broadcast on KQED. The Paw Print is a SNO Distinguished Site for the 2018-2019 school year, earning six out of six SNO badges and demonstrating mastery of social media, story excellence, site excellence, coverage, and multimedia. The Paw Print ranks #8 in the nation for SNO Distinguished Sites. 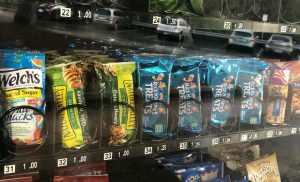 The following articles/packages were published on the Paw Print and were later accepted by SNO administrators as examples of the “best stories being published on the SNO Sites network” (bestofsno.com). Over 11,200 stories have been submitted to Best of SNO nationwide (about 17% have been accepted) among the 300+ schools that are participants. The Paw Print currently ranks #10 in the nation for the number of accepted stories! The Paw Print received SNO’s Story Page Excellence Badge, where students had to create eight stories “that go beyond the text to enhance the reader’s experience.” They used different templates to add engaging elements to articles, and they added interactive pieces to the website. The Paw Print received SNO’s Audience Engagement Badge, where students had to use social media to engage their audience while gaining over 1,000 total followers. They also studied their analytics, and got thousands of page views on their website. The Paw Print received SNO’s Multimedia Badge, where students produced multiple high-quality videos, podcasts, and three photo slideshows. They learned how to create effective and engaging pieces on different platforms, and they learned the differences between different types of media. 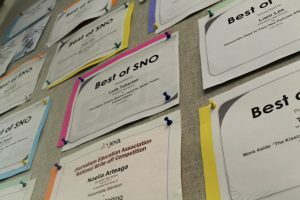 The Paw Print received SNO’s Continuous Coverage Badge, where students updated the Paw Print site regularly throughout the school year and demonstrated a commitment to timely online journalism. Woodside Journalism II and III students traveled to Chicago to attend the JEA Convention and participate in competitions with other schools across the country. The following students received honors from JEA. *Chloe Postlewaite, Isabella Williams, and Taila Lee participated in a group competition to collaboratively produce an online news package about 2018 midterms. You can view their project here, which was published on the Paw Print as a submission. The following awards were presented to journalism and video students by JEA.